The most critical global security threats in the information sphere are analyzed in the article, and, as a result, it was made a conclusion about the increasing of information confrontation and infiltration of tension in relations between countries. This situation requires a new qualitative approach to IT specialists’ training, focusing their attention primarily on the practical plane in the field of information and cyber security, and taking into account the most relevant expertise that a future specialist should receive in the field of cyber security. To solve this problem, the most important priority areas for the training of such specialists are identified in the article. According to the results of the analysis of Ukrainian legislation in the field of information and cyber security, as well as the typical cyber security plan of the NATO, examples of models of training competencies for the national cyber security system are proposed in the article. Considering that the main subjects of the national system of cyber security in accordance with the Constitution and laws of Ukraine are the State Service for Special Communications and Information Protection of Ukraine, the National Police of Ukraine, the Security Service of Ukraine, the Ministry of Defence of Ukraine and the General Staff of the Armed Forces of Ukraine, intelligence agencies and the National Bank of Ukraine, the models of professional competences of the employees/personnel of these organizations training, agreed with the tasks entrusted to these structures, are proposed in the article. As a result, the proposed models of professional competences may be the basis for the development / improvement of educational programs and curricula for training specialists in the field of cyber security, especially at the first, Bachelor’s level of higher education, and may become the basis for adjusting the relevant standard agreed in 2017 by the national Agency for Quality Assurance in Higher Education. In the future, the creation of new standards for cyber-security, both in the second (master's) and in the third (educational-scientific) levels will be promoted. А. М. Прохоров, Человек. Большой энциклопедический словарь, 1993, 2-е изд., М., Большая российская энциклопедия, 1632 с.
М. Кастельс, Информационная эпоха: экономика, общество и культура, 2000, М., ГУ ВШЭ, 608 с.
В. П. Леонтьев, Большая энциклопедия компьютера и Интернета, 2005, М., ОЛМА-ПРЕСС Образование, 1104 с. World Economic Forum, Reports 2018 [Електронний ресурс]. Режим доступу: http://www3.weforum.org/docs/WEF_GRR18_Report.pdf . Дата звернення: 24 Травня, 2018]. R-Vision, Прогнозы по информационной безопасности на 2018 год [Електронний ресурс]. Режим доступу: https://rvision.pro/blog-posts/prognozy-po-informatsionnoj-bezopasnosti-na-2018-god/ Дата звернення: 24 травня 2018. Euronews, Давос 2018: совместный ответ глобальным угрозам [Електронний ресурс]. Режим доступу: http://ru.euronews.com/2018/01/24/davos-2018-what-are-humanitarian-organisations-bringing-to-the-world-economic. Дата звернення: 24 травня 2018. В. Л. Бурячок і В. М. Богуш, "Рекомендації щодо розробки та запровадження профілю навчання ,кібернетична безпекаʻ в Україні", Ukrainian Scientific Journal of Information Security, 2014, №20, 2, сc. 126–131. Ю. В. Борсуковський і В. Л. Бурячок, "Роль і місце вищих навчальних закладів у створенні системи інформаційної та кібернетичної безпеки України", Сучасний захист інформації, 2017, №1, сc. 34–40. "Закон України Про основні засади забезпечення кібербезпеки України", 2017, ВВР, № 45, ст. 403 [Електронний ресурс]. Режим доступу: http://zakon0.rada.gov.ua/laws/show/2163-19 Дата звернення: 24 травня 2018. Ю. Г. Даник і Ю. М. Супрунов, "Деякі підходи до формування системи підготовки кадрів для системи кібернетичної безпеки України", Збірник наукових праць ЖВІ НАУ „Інформаційні системи“, 2011, в"п. 5, сc. 5–22. А. І. Міночкін, "Інформаційна боротьба: сучасний стан та досвід підготовки фахівців", Оборонний вісник, К., Центр воєнної політики та політики безпеки, 2011, №2, сс. 12–14. В. Сисоєв, "Аналіз рівня освіти та підготовки фахівців з управління IT та інформаційної безпеки в Україні", [Електронний ресурс]. Режим доступу: http://www.auditagency.com.ua/blog/ISACA_research_Education.pdf. Дата звернення: 24 травня 2018. "Перший стандарт вищої освіти стосується кібербезпеки" [Електронний ресурс]. Режим доступу: https://ligazakon.net/lawnews/doc/-nz173112-pershyy-standart-vyshchoyi-osvity-stosuyetsya-kiberbezpeky?type=ep. Дата звернення: 24 травня 2018. “Cybersecurity: A Generic Reference Curriculum (RC). Dear Partners/NATO Members, 4500-1 (OSEM PED)”, Oct. 2016, 73 р. “ISO/IEC 27032:2012. Information technology — Security techniques — Guidelines for cybersecurity”, 50 p.
Center for Internet Security, CIS Controls Version 7 — What’s Old, What’s New [Електронний ресурс]. Режим доступу: https://www.cisecurity.org/cis-controls-version-7-whats-old-whats-new/. Дата звернення: 24 травня, 2018. Center for Internet Security. CIS Controls [Електронний ресурс]. Режим доступу: https://www.cisecurity.org/controls/. Дата звернення: 24 травня, 2018. A. M. Prokhorov, Human. The great encyclopedic dictionary, 1993, 2nd ed., M., Bol'shaya rossiiskaya entsiklopediya, 1632 p. (in Russian). M. Kastel's, Information age: economy, society and culture, 2000, M., GU VShE, 608 p. (in Russian). V. P. Leont'ev, Great encyclopedia of computer and Internet, 2005, M., OLMA-PRESS Obrazovanie, 1104 p. (in Russian). World Economic Forum, Reports 2018 [Online]. Available: http://www3.weforum.org/docs/WEF_GRR18_Report.pdf. Accessed on: May 24, 2018. R-Vision, Information security forecasts for 2018. [Online]. Available: https://rvision.pro/blog-posts/prognozy-po-informatsionnoj-bezopasnosti-na-2018-god/.Accessed on: May 24, 2018. (in Russian). Euronews, Davos 2018: a joint response to global threats. [Online]. Available: http://ru.euronews.com/2018/01/24/davos-2018-what-are-humanitarian-organisations-bringing-to-the-world-economic. Accessed on: May 24, 2018. (in Russian). 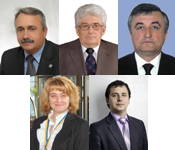 V. L. Buryachok and V. M. Bohush, Recommendations for developing and implementing a training profile, cybernetic security in Ukraine,” Ukrainian Scientific Journal of Information Security, 2014, no. 20, 2, pp. 126–131. (in Ukrainian). Yu. V. Borsukovs'kyy and V. L. Buryachok, The role and place of higher educational establishments in the creation of a system of information and cybernetic security of Ukraine,” Suchasnyy zakhyst informatsiyi, 2017, no. 1, pp. 34–40. (in Ukrainian). The law of Ukraine on the basic principles for the cybersecurity of Ukraine,” 2017, VVR, no. 45, art. 403 [Online]. Available: http://zakon0.rada.gov.ua/laws/show/2163-19. Accessed on: May 24, 2018. (in Ukrainian). Yu. H. Danyk and Yu. M. Suprunov, Some approaches to the formation of a system of training for the system of cybernetic security of Ukraine,” Zbirnyk naukovykh prats' ZhVI NAU “Informatsiyni systemy,” 2011, no. 5, pp. 5–22. (in Ukrainian). A. I. Minochkin, Information struggle: current state and experience of training specialists, Oboronnyy visnyk, K., Tsentr voyennoyi polityky ta polityky bezpeky, 2011, no. 2, pp. 12–14. (in Ukrainian). V. Sysoyev, Analysis of the level of education and training of specialists in the management of IT and information security in Ukraine] [Online]. Available: http://www.auditagency.com.ua/blog/ISACA_research_ Education.pdf. Accessed on: May 24, 2018. (in Ukrainian). The first standard of higher education concerns cybersecurity. [Online]. Available: https://ligazakon.net/lawnews/doc/-nz173112-pershyy-standart-vyshchoyi-osvity-stosuyetsya-kiberbezpeky?type=ep. Accessed on: May 24, 2018. (in Ukrainian).